Concern for the environment is a major driver of Intercreate projects. This is partly due to global warming and species loss, and is also due to our engagement with indigenous groups, for whom the environment is of urgent concern. This has resulted in projects in our local botanic garden, and partner projects that involve indigenous peoples. 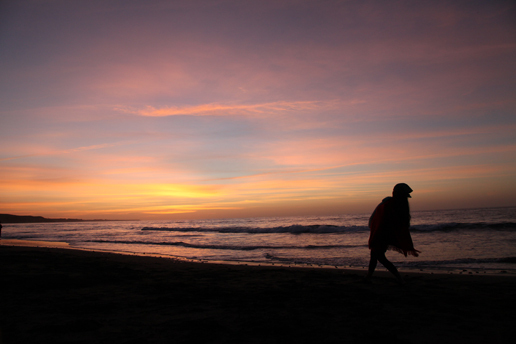 Our main cultural partner is Te Matahiapo Indigenous Research Organisation. 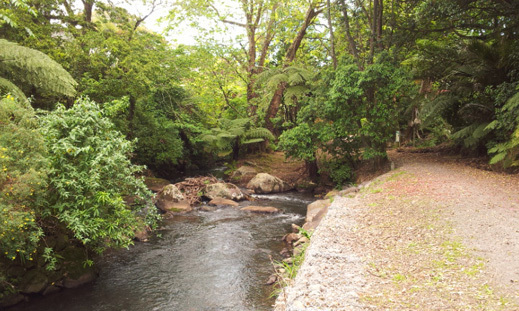 While we were very pleased with the SCANZ 2013 exhibition in Puke Ariki library museum, for SCANZ 2015, we want to locate art works along a river walkway, the Huatoki. Intercreate has a permanently installed data sensor to internet connection in Pukekura Park, first used for the project The Park Speaks above. Collaborators on The Park Speaks were Ian Clothier (system concept), Julian Priest, Andrew Hornblow, Adrian Soundy, Aafke Visser, Mark Dwyer, Aafke Visser, Peter Wareing and Jock McQueenie. 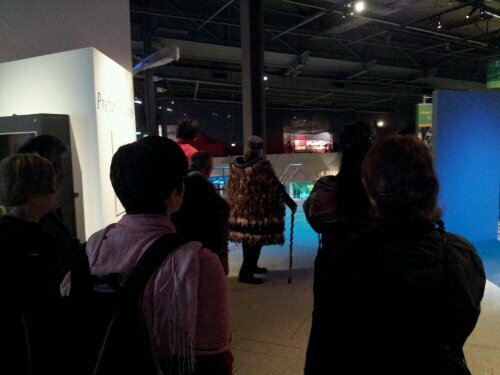 Wai was a milestone in our collaboration with Te Matahiapo. 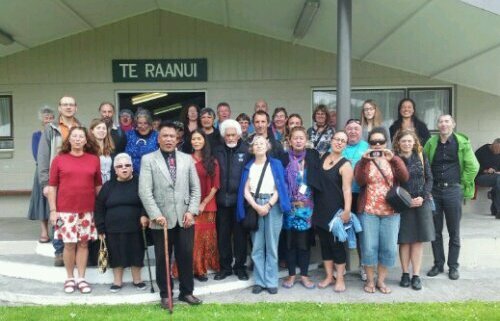 Following the direction given by Dr Te Huirangi Waikerepuru, we endeavoured to involve local indigenous groups. Via Jo Tito we were put in contact with Gordon Bronitsky, who was able to establish links for us to Navajo or Dineh people. This resulted in Andrew Thomas contributing the audio that was heard, and Johnson Dennison, a Navajo Medicine Man contributing to our tomo whakaari (dawn opening ceremony). This was an extraordinary event. 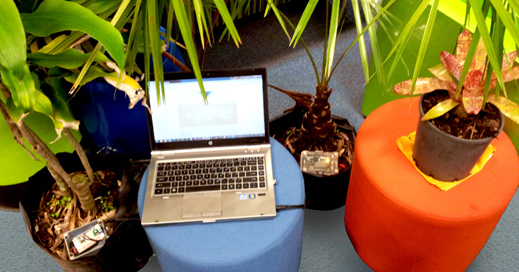 This is the test set up in Noosa Australia, where we connected the plant on the left and a tree in New Zealand to our project website and their live voltage data to control audio files. Using the system established for The Park Speaks we tested connecting across the Tasman sea, joining Australia and New Zealand in one integrated creative system. Trans-Tasman integration project has become World Tree Orchestra which seeks to connect trees globally. This data sensor by Pierre Proske measured soil moisture content, which was relayed to a set of output devices mounted on poles. Audio based on the data was output at dusk. Additional projects in Pukekura Park include Brickets by Pierre Proske. Intercreate has a resident Creative Engineer Andrew Hornblow, who assisted Proske with developing the technology to broadcast data as audio during dusk. This was a SCANZ 2013 project. Layers of audio by Nigel Helyer referenced multiple notions of underworld and filled one end of the Fernery in Pukekura Park botanic garden. The above project by Nigel Helyer Songs from the Underworld, was received postively by visitors to the Fernery in Pukekura Park, and adopted by the staff who maintain the park and the Fernery. Some of the audio included chanting by members of Te Matahiapo, in a work that engaged with ideas of the Underworld, in both Western cultural and Maori terms. Curated by Ian Clothier, the works in SCANZ 2013 3rd nature exhibition spiral from the Puke Ariki Museum gallery Te Takapou Whāriki o Taranaki (The Sacred Woven Mat of Taranaki) out onto level 2 and around the natural history and geology galleries, down the stairs on to the landing and beyond into Pukekura Park botanic garden. Te Huirangi Waikerepuru at this mornings Tomo Whakaari. Beside him is Tengaruru Wineera. Terri Ripeka Crawford choreographed a special accompaniment to the traditional ceremony. Voices from all filled the morning air. 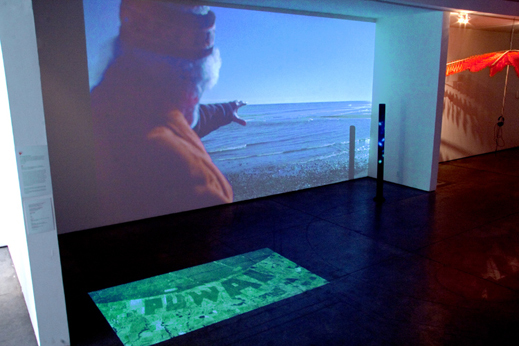 The image above shows preparation work for the 3rd nature exhibition in Puke Ariki. The cyanobacteria was cultured by artist-scientist Professor Hideo Iwasaki of Waseda University, Japan. Professor Iwasaki grows the cyanobacteria in a form derivative of humans, with a head, body, arms and legs. The cyanobacteria are photosynthetic bacteria, and are ancestors to chloroplasts in plants. A chloroplast captures energy from the sun, and it is said that cyanobacteria helped to make Earth suitable for life. 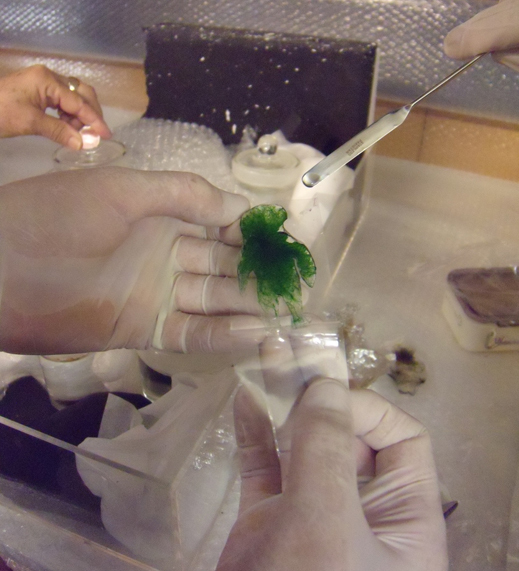 While on exhibition at Puke Ariki the cyanobacteria will be growing slowly, over a period of two months. Instead of the sun, the bacteria will photosynthesise with the light from an animation projected on to them from below. This is the middle weekend of the residency. Some went up the mountain, others gathered late in the day at Back Beach Paritutu. Today’s workshop was held in the venue to be used at WITT for the wananga-symposium. 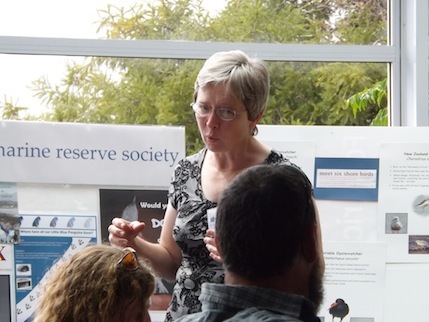 Our guest were Mike Ure, Elise Smith and Anne Scott of the Nga Motu Marine Reserve Society. Mike is also part of the Ahu Ahu beach group. Elise Smith spoke about the little blue penguin project. The society has been gathering data on the penguins, and placing it online using maps. 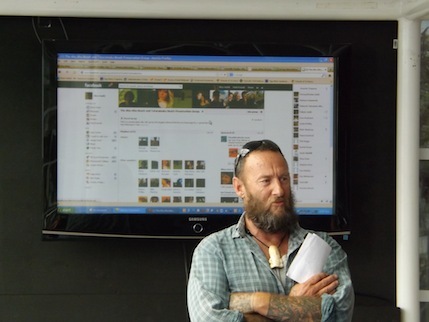 The aim is for Maori knowledge and creative projects to be added to the same online map. 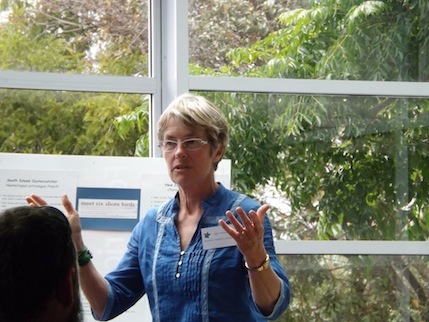 Anne Scott from the Marine Society discussing the aims of society projects. Thanks to Martin Drury for the images. 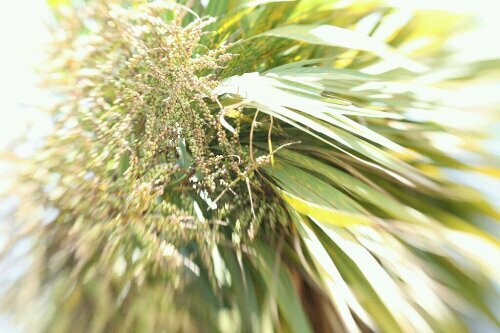 Today the residency theme was harakeke/raranga (flax/weaving). Jo Tito led the day with a local weaver. First up was harakeke gathering then some making. The image above was taken using a lens provided by Deborah Lawler-Dormer. 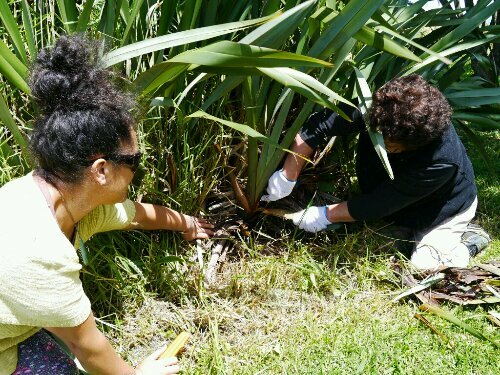 Jo tito and Mako Jones, who led the day, gathering the harakeke. 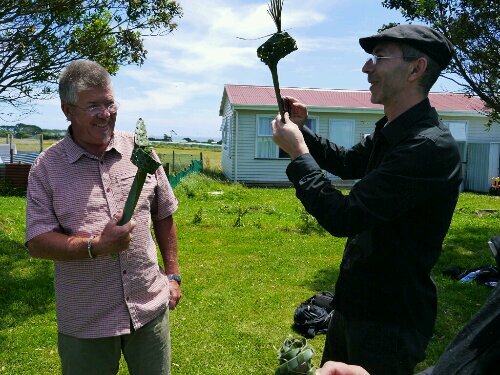 Part of the day involved hearing what harakeke means to Maori. Nigel Helyer and Darko Fritz at Puniho with woven works. 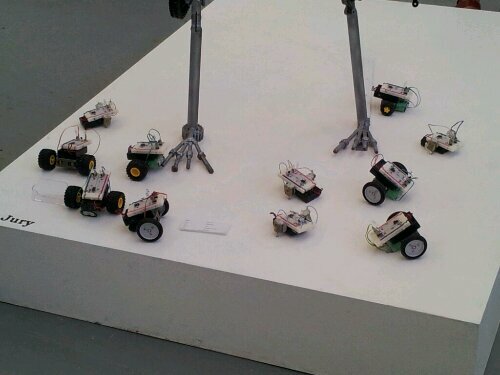 Two wheeled robotic cars emerge from the Andrew Hornblow residency workshop. There was also quite bit of interest in tree voltage data sensors. 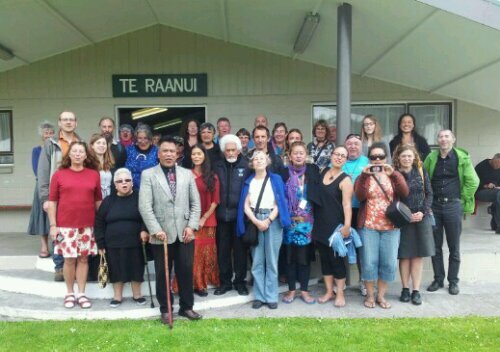 SCANZ 3rd nature artists with members of the Parihaka community after we shared a meal. A memorable two days for all engaging with culture and korero about Peace and restoring positive relationship with the environment.